It was nice visiting with family on this Easter Sunday, and even nicer having their residence adjacent to a boat launch into the Blackstone River. That provided this paddler some time to explore a bit of the river during the intermission between dinner and desert. After launching a little upstream of the Rolling Dam, I paddled up to the Triad Bridges in Millville (opening photo). At this locale multiple transportation paths once converged: Level one is the Blackstone River which once also served as part of the Blackstone Canal; Level two is the Providence and Worcester Railroad, a still active railroad (iron truss on left behind another); Level three is the former New York and New England Railroad, no longer active and now part of the Southern New England Trunkline Trail (in front of and to the right of the P and W); and finally level four which is the unfulfilled dream railroad, Southern New England Railway (tall concrete bridge abutment to right of NY and NE). This railroad was never completed though substantial grading and stonework was done in Massachusetts between Palmer and Blackstone. 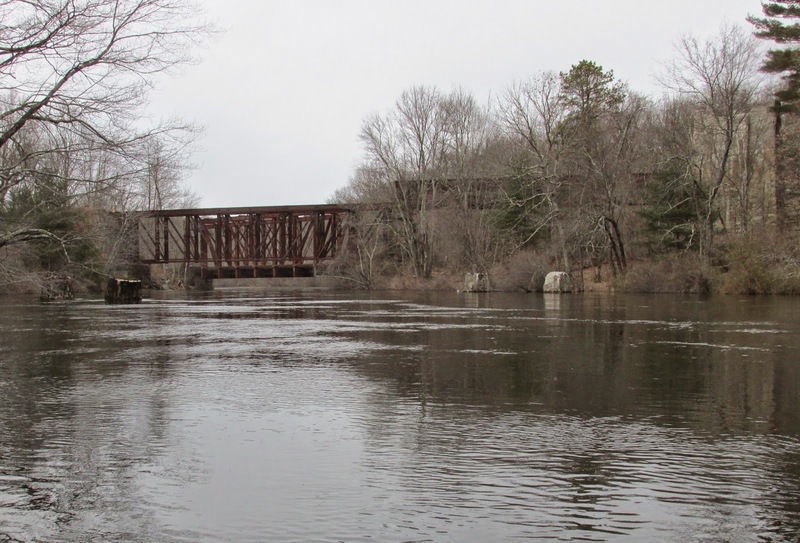 Had it been finished, it would have been a grand sight to see its trains cross high above the Blackstone River and the two other railroads. Imagine a paddler lucky enough to see three trains converge at this spot at the same time. Ah, what might have been. One possible reason for the Southern New England Railway not having been completed may have been because its visionary, Charles Melville Hays, perished aboard the Titanic. Since the lock tender was nowhere to be found, I turned about and headed back downriver. Aside from a pair of common mergansers, a pair of Canada geese, and a blue heron, I had the river all to myself. Al - you were in my neighborhood. I've paddled that section of the Blackstone many times. We should make arrangements to get together sometime. Hi Erik, Yes I was pretty close to Woonsocket and remembered some of the video you shot going through Millville. Agree on getting together. Either on one of the rivers up this way or perhaps on one of your RICKA paddles in RI. I was thinking about a RICKA trip up your way - maybe the sudbury this year. Has RICKA done the Sudbury up by Route 20 and Heard Pond?